Our in-line thermoforming equipment is capable of forming and trimming small to medium size parts, employing both vacuum and/or pressure forming. We handle materials up to .080″ thick. Maximum mold area is 26″ x 24″. Since the vacuum forming process uses low pressures, the molds can be made of inexpensive materials and mold fabrication time can be reasonably short. The vacuum forming process is perfect for prototyping production parts and for small and medium sized production runs. 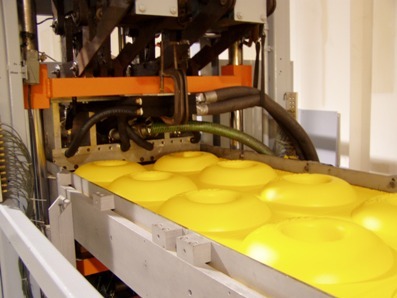 Pressure Forming is a sophisticated version of the vacuum forming process utilizing air pressure as a forming aid to increase the detail on the mold side. The pressure applied is several times higher than with vacuum forming, which makes it possible to obtain highly detailed features at close tolerances. Pressure forming is proving to be a valuable technique for the computer, electronic, industrial, and medical industries. It is enabling them to get parts into the market quickly that have the look of injection molding, without the lead times or tooling expense. Pressure forming can provide the structural integrity, aesthetics and design flexibility usually found only in injection molded parts.